is the challenge course program of the Boy Scouts of America. It is a series of physical, mental and emotional challenges facilitated by a trained staff directed at enhancing personal growth. Teamwork - Teamwork is the key that allows a group to meet a COPE challenge successfully. The COPE experience makes it clear that each individual can accomplish more as a member of a team than going it alone. Communication - Project COPE encourages real learning of critical listening and discussion skills important for any group attempting to accomplish difficult tasks. Trust - Participants completing difficult tasks on a COPE course develop trust in COPE staff members, the safety of the course, each other and themselves. Leadership - Leadership is given and assumed naturally, and can be expressed in many ways. Team members attempting to solve problems on a COPE course have many opportunities to develop and exercise leadership skills. Decision Making - Project COPE requires groups to make decisions by developing one or more solutions to a problem, considering the available resources and alternatives, and evaluating the possible results. Problem Solving - Project COPE challenges groups and individuals to develop solutions to interesting problems. Participants can then test their solutions and evaluate the results. Self-Esteem - Meeting the challenges of a COPE course allows individuals and groups to develop self-esteem and encourages them to adopt challenging attainable goals. What types of groups might benefit from COPE? Project COPE is a program of the Camping Division of the BSA. 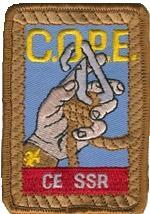 Each COPE course is run locally by the area BSA Council, under the rules and regulations set by National BSA. Councils which operate a COPE course must designate a COPE Director to supervise the administration, safety and operation of the program. Each COPE director must be certified by National by successfully completing the approved training for this position. Project COPE is a flexible experience that can be custom designed specifically for your group. Course length can be from a few hours to several days. The experience takes place at Camp Eastman, near Nauvoo, Illinois. However, there can be a number of exercises that can take place at your location. This program provides a vehicle for groups to challenge themselves to reach personal and team goals. Project COPE is designed to breakdown barriers between individuals and create an atmosphere of shared leadership and problem solving. Any adult or older Scout who is interested in becoming certified to lead/assist inn the operations of our COPE/Climbing courses may attend the Spring or Fall COPE Training Weekend.